Located on the windy Atlantic coast, about two hours southwest of Marrakesh, is the small city of Essaouria. “Swerah,” as locals call it. 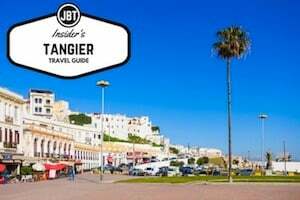 Or it’s old Portuguese name “Mogador,” Our Essaouira travel guide will help you discover the highlights. 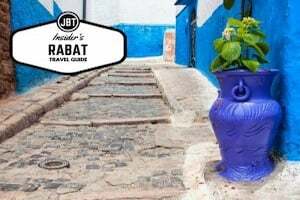 This blue seaside town combines some of the best of what Morocco has to offer — excellent beaches, great food and vibrant culture — with a chill atmosphere that isn’t as prominent in other parts of the country. This vibrant city has a long history of colonization. The Portuguese were responsible for the construction of the massive stone walls that still surround the old medina of Essaouira. This, among other reasons, is why it is listed as a UNESCO World Heritage site. With its long beach, calm harbor and friendly locals, Essaouria has developed into one of the more tranquil spots in Morocco. Windsurfers glide over the waves, the call of seagulls echo, and fishing boats pull into harbor. The salt air here is a crisp respite after a few days in Marrakesh or the heat of the Sahara. Fun Essaouira Fact: If you are a Game of Thrones fan, you will recognize Essaouria as the backdrop from where Daenerys Targaryen purchased her army of Unsullied soldiers. Here is a map of the Essaouira medina. We include a similar map in each itinerary packet that travelers receive before their tour takes place with us at Journey Beyond Travel. Essaouria has been a port town for quite some time. There is evidence of prehistoric settlements and, in the 5th century BC. The first known settlement was established. Like a lot of the coastline of Morocco, passed through Phoenician, Carthaginian and Roman control. After the Romans left Morocco, Juba II, a tribal king, established a factory that processed a purple dye prized for its richness of color. The dye was taken from the murex, a type of sea snail indigenous to the Purples Islands, just off the beach of Essaouira. The settlement became known locally as Sidi Megdoul. It was named after a religious leader who was buried here in the 11th century. However it wasn’t until the Portuguese built the fortress in 1506, with its ramparts and stone walls, that the Essaouira we know today took form. They dubbed the city Mogador, likely a corruption of “Megdoul.” Along with a few other cities in Morocco, such as Asilah and El-Jedida, Essaouira was a fortified Portuguese stronghold. The Portuguese lost control of the city and, like Salé, Rabat and Asilah, to the north, became a pirate city until the 18th century. Today, music and art are two of the biggest draws throughout the year to this tranquil hub of Morocco. Jimi Hendrix once sojourned here. Rumors persist that the song, “Castles Made of Sand,” was written while he was in Essaouria. Of course, the album was released in 1967 and Jimi didn’t travel to Essaouira until 1969 — a full two years after the fact! Proving that rumors are just that. However, blues, rock and local gnawa music first did collide here in the tumultuous 60s, creating a fusion of incredible music unheard anywhere else in the world. Every year there is a music festival held at the end of June, the Gnaoua Festival of World Music. Throughout the year, musicians can be found on the ramparts, playing traditional Gnaoua music. Several painters and sculptors call Essaouria home. Some of the more popular artists are featured in several stores and galleries scattered throughout the medina. In 2013, the television show “Voyages” selected Essaouria as one of the “Ten Happiest Destinations” on Earth. Go Fly a Kite – Well… go kite surfing, anyway. Essaouira is known as North Africa’s wind capital and rightly so. The wind can really get gusting at all times of year because of the natural geography of the area. Just south of the medina are several locations to rent surf equipment. You can also set up surfing, kiteboarding, windsurfing, or kitesurfing lessons. The latter is the latest draw to this oceanside town. Near-perfect conditions can be had every day of the year. Learn how to Kite Surf or Wind Surf with the experienced professionals at ION Club. 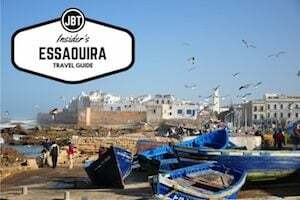 More companies are available than what can we can include in this Essaouira travel guide! The high season runs from the beginning of April to the end of September. Take a Cruise – At the port is a sailing tour that takes place from 10:30am – 2:30pm. It is best to book the day before and the cruise is weather dependent. Sunset cruises also available. For both cruises, tea and Moroccan pastries are served. Go Spice Shopping – Stop by Si Said’s shop in the spice market for spices, stuff your pockets with elusive saffron. If you’re lucky, you’ll find “royal tea.” This is a special Moroccan tea made of a combination of 15 spices. You’ll find great prices here as well. You can find Said behind the fish market in the medina at no.199 Marché aux épices. Be a Beach Bum – Most people come to Essaouiria to enjoy its picturesque beach. A series of ruins about a 1.5 kilometers to the far end of the beach make a worthy stop. You can walk, swim or ride a camel or horse to explore the ruins. On less windy days, Essaouira is one of the more relaxed beaches in the country. Rent a beach chair, be, relax, watch kite surfers, soccer players, read a book and work hard on that tan. Get Cooking! – One of the best cooking schools in Morocco, hands down, is l’Atelier Madada, which offers a workshop with Chef Mouna. Reserve well ahead of time. 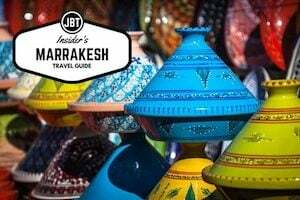 Forgive the plug – this is one of many superb activities that you can tack on to your journey to Morocco with our team (among other activities you’ll read about in our travel guide to Essaouira)! You’ll be able to chose from a variety of different dishes off a select menu. An expansive kitchen awaits the creativity of experienced cooks and non-cooks alike. Cooking classes run from 10am-2pm. A Patisserie Class is also offered from 3:30-5:30pm, except Sundays. Shop at Mashi Mushki – Named for the phrase in Moroccan Arabic that is the equivalent to the Australian (Aussie) “no worries,” 10% of the profits from this small shop/gallery – located in the north of the medina on Rue Chbanate – go to Project 91, a charity that works with kids in the area. And, across the street is the Project 91 charity shop selling second-hand clothes and other goods. 100% of their profits go to the local community. Mashi Mushki is open from 11am to 6pm; the Project 91 shop opens most afternoons. Admire Upcycled Trash – Made of junk you might find in a garage, the artist who goes by his first name, Rachid, creates some funky statues made from recycled bits you might find in your uncle’s garage. These make a great gift or centerpiece for your house. Rachid’s workshop and store is about a hundred yards after Bab Marrakesh in the west side of the medina. Some of his recycled sculptures include snails, fish and ants playing violin. You’re guaranteed to find something that will make your smile. 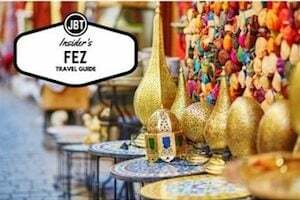 Tell him you found him in the JBT Essaouira travel guide! The Ramparts – Take a stroll along the old Portuguese ramparts as the sun sets over the Atlantic Ocean. Listen to the waves crash and watch as the world transforms into hues of orange, pink and red. Make sure to bring your camera! Many old (non-functioning) cannons line the walk over the cobbled stone and make for a great photo opportunity. The best viewpoint may be on the north side of the ramparts. Beneath the ramparts, various artisan shops sell locally made crafts. These are worth peaking into for trinkets and souvenirs. Mellah – In the 18th century, the Jewish population made up nearly half of the population of Essaouira Get in touch with a bit of this history, tour the expansive Jewish cemetery, check out the numerous synagogues still intact and take note of the Stars of David engraved above many of the doors in this neighborhood. Sidi Mohamed Ben Abdallah Museum – For a glance into the history of the region, check out the collection of pottery, jewelry, weapons and tools housed in this repurposed 19th century riad. For architecture nerds, the photography exhibit of the history of Essaouira is worth the price of admission. Rue Laâlouj, +212 (0)5 24 47 53 00. Open daily 10am-6pm. La Table Madada – Upscale, French-Moroccan fusion at its finest. The menu features some classics, such as spider crab and avocado tartar with hints of argan oil. Tiger prawns are perfectly grilled, served alongside Moroccan charmoula and Taliouine saffron rice. Tapas are also served. A great option to stop in for a nibble before heading out on the town. 7 Rue Youssef el Fassi, +212 (0)5 24 47 55 12. Open Wed-Mon, 7pm-11pm, reservations highly recommended. Dar Kenavo – The fine establishment of Dar Kenavo serves lunch and dinner in an all organic mix spiced with a seasonal menu. It’s a bit more upscale with a three-course lunch and dinner. Located about 12 kilometers from the medina with a wonderful garden and a heated pool. A nice break from the beach crowds for those looking to spend an afternoon poolside. Douar Bouzama – BP344, Ghazoua, +212 (0)5 24 47 48 35. Reservations onlyChez Sam – Chez Sam serves fish fresh from the nearby dock. The menu is both filling and delicious. A rustic, port restaurant with a nice terrace, though unfortunately, like most restaurants, smoking is allowed. Essaouira Port, +212 (0)5 44 47 65 13. Open daily noon-3pm and 7pm-11pm, reservations recommended. Triskala Cafe – A great stop for some delish vegetarian options or just a quick tea or coffee. A funky vibe channels the 60s. Pictures of Bob Dylan and Jimi Hendrix (among others) line the walls. This cafe strives to be eco-friendly and only serves local products. Rue Touahen, +212 (0)5 24 47 63 73. Open Mon-Sat, 10am-10pm, Sun 1pm-10pm, no reservations needed. Caravane Cafe Art – Recommended by some past travelers as a superb little spot to grab a bite, the Caravane Cafe Art offers a variety of menu options; even Indonesian and vegan! 2 bis Rue du Qadi Ayad in the medina, +212 (0)5 24 78 31 11. Open Tues-Sun, 11am-11pm, reservations recommended. Beach and Friends – Located just off the beach south of the medina. Outdoor beer, wine, cocktails in lounge chairs, listening to the surf. A great place to grab a refreshing drink midday or watch the sunset. Food is optional and easily skippable. However, one of the best places to sip on an aperitif to begin the evening. 5 Boulevard Mohamed, La Corniche, +212 (0)5 24 47 45 58. Open daily, 11am-11pm, no reservations needed. Port Grills – Great for seafood lovers (though you’ll have to deal with vendors from every stall), this place has food stalls of the fish variety that might be compared to that of Jemaa el-Fnaa (which you can also read more about in our Marrakesh travel guide), although admittedly cleaner. The creativity and variety is lacking, but it’s a great place to grab local, fresh grub. Located just before the port on the rampart thoroughfare. Negotiate a bit but plan on buying a massive plate of sardines, one medium sole, one medium rouget, a small pageut, a handful of shrimp, a few langoustine and a giant crab for around 120 dirhams. Seagulls fly overhead, so watch out for unwanted droppings from above! Everything is grilled BBQ style with few sauces, accompaniments or spices. Read more about Essaouira in our collection of articles that highlights some more hidden parts of the city. 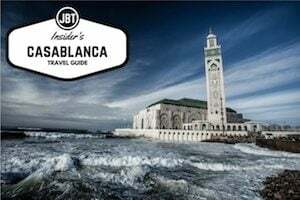 While your at it, feel free to read more about other places in Morocco, such as in our Casablanca travel guide, or another special “Blue City” in our Chefchaouen travel guide; a quaint Spanish-influenced town tucked in the mountains. Journey Beyond Travel arranges top-notch custom and private tours in Morocco. If you’d like more details, feel free to reach out to us for the trip of a lifetime! Our Insider Guides are written by Morocco expert, author and photographer Lucas Peters. 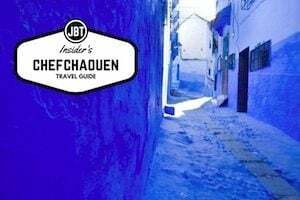 After spending years traveling to the distant corners of Morocco and writing about his adventures, he penned the best-selling guidebook Moon Morocco. He is now based in Paris, where he lives with his wife and son.